“Every yerba mate drinker needs a calabash gourd.” Yup, that’s what I’ve told almost every serious Matero (yerba mate enthusiast) that has asked me which gourd to go with over the years. Granted, it’s much easier to use a glass, silicone, or wooden gourd, since they dry easily and you don’t have to worry about any curing, mold, whatever, but still! Something about the good ol’ calabash gourd…ahh… so simple and true. There’s nothing else like it. A different vibe, for sure. What’s the Difference between a Calabash (Calabaza) and Cuia Yerba Mate Gourd? The general term “calabaza” simply means “squash” in español. “Calabash” in English, as we’ll refer to it moving forward. The term “cuia” is also used to describe a calabash mate gourd in Brazil. Effectively, these terms are interchangeable. However, there are differences in the shapes, sizes, and styles of mate gourds between Argentina and Brazil, the two countries where mate is insatiably enjoyed every day, along with Uruguay and Paraguay where over 90% of the populations consume mate daily. I kid you not. Mate life is serious out there. Calabash gourds are as much a part of the Argentine identity as a French Press in France and moka pot in Italy. From time immemorial, the simple calabash gourd has been used across the Argentine, Paraguayan, Brazilian, Uruguayan regions. The Guaraní Tribe of Paraná, evolving from chewing and spitting the mate, begun using these vessels along with hollowed twigs to consume “the drink beyond a drink” – a practice that continues to this day as millions of people across South America and beyond prepare mate the traditional method, with a gourd and bombilla. The Argentine calabash gourd is usually thinner and lighter. They’re generally smaller than cuias and more times than not, no support is needed to rest the gourd on a flat surface (many times, you’ll see cuia resting inside a leather or metal chair). Fresh gourds usually have a flaky interior that slowly breaks down over continual use as the gourd naturally cures on its own. Cuias are generally larger and thicker, with a sponge-like interior (usually no flaking). The gourds are closer to the wood spectrum than calabashes. They’re more prone to absorbing the flavors of the mate which makes for interesting subtle tastes profiles, constantly evolving over time. Conversely, Argentine calabash gourds absorb less flavors, which helps to preserve the true taste of the mate with each cycle (completion of the gourd before hot water is added once more). 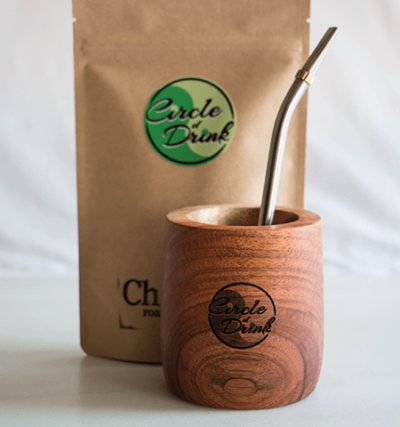 You can drink just about any type of yerba mate with any gourd and bombilla. However, for the mate connoisseur, that’s not going to cut it. No sir! When drinking finely ground mate from Brazil, referred to as erva mate and chimarrão (mate grown specifically for the local Brazilian market – pronounced she-ma-HOWN), it’s best to use a Brazilian cuia along with a spoon bombilla that has a high amount of filters – pin-sized holes on each side of the spoon filter. The high density of holes decreases the chances of clogging – but keep in mind, it’s totally normal for small amount of mate particles to pass through the bombilla (“bomba” in Brazil) during the first several cycles. Ximango is a prime example of Brazilian erva mate. For your classical Argentine mates, predominately coming out of the Misiones region of Northern Argentina, an Argentine calabash gourd with any traditional spoon or double-action bombilla will do. These mate varietals contain coarse cut leaves and moderate amounts of chopped twigs (called “palos” in español), making for additional surface area – that means that you don’t necessarily need a spoon bombilla with plenty of filters to drink Argentine mate; just about any bombilla will do. Cruz de Malta, Mission, and Piporé are fine examples. Okay folks, so here we are. Two standard calabash gourds. The Argentine Calabash and the Brazilian Cuia. Neither one is better than the other – it’s a matter of style, preference, and cultural identity. I enjoy drinking from both fashions on a regular basis, making for a nice departure from the more modern wooden gourds, which, in my mind, are in a different class unto themselves. Whichever gourd you’re drinking from, have fun and enjoy the gift of mate. What a powerful, amazing, miraculous plant! What an honor to continue this tradition. Salud! Do you by any chance have a suggestion for preparing chimarrão in a glass cuia? I have a glass cuia and I’m not having any success drinking it without instant collapse /clogging . :-( Obrigado!